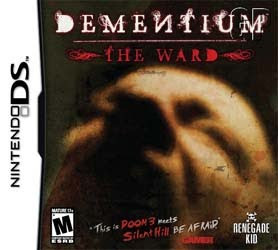 I'm playing Dementium: The Ward.... first off, the production values for this DS horror game are terrific. This is a really nice looking and sounding game that pushes the system near to its limits the way few other DS games seem to do.... games like this and MechAssault: Phantom War show that even though the DS is not as powerful as the PSP, it's still capable of quite a lot with 3D-graphics gameplay. Dementium also has smooth controls: the D-pad controls your movement; you can double tap & hold up on the pad to run... and the stylus & bottom screen controls your look/aiming. What's cool is that the bottom screen doesn't require a display or "space" your stylus has to sit on to aim properly, it feels fairly precise & smooth and the bottom screen shows info so as to maximize efficiency of it. My big beef with the controls is that there should have been an option to control look using the DS face buttons. Holding the stylus makes it difficult to support the DS with 2 hands and it gets tiring playing because of it. If I could use the face buttons to look it would be a lot more comfortable to play. But as great as the production and controls are, the game is nearly *ruined* by the absolute craptastic save system. You can spend 30 minutes to 1+ hours going through a level, die at a boss battle or a tough enemy... and then you have to start the level (called "Chapters") from the beginning-- losing everything you collected or puzzles you've solved. Another major problem is respawning enemies: you go through a room, kill off some zombies or whatever, then go through a door. If you go back through the door you came in, to the room you just cleared, guess what? Yup, all those enemies are back. That is an antiquated, outdated form of game design that should have died off about 25 years ago. It's inexcusable to have such a crap feature unless it's important to gameplay; some games need to have respawning enemies because you need to get something from them or whatever. In those cases, then it makes sense. But that is NOT the case here. Developer Renegade Kid needs to read my post about the art of save points... like seriously, what were they thinking with this kind of save design? They clearly worked very hard to craft a really nice game... it's like smearing ketchup over a beautiful painting.... what a waste. The awful save system & their *stubborn* refusal to allow face button look/aim control... I can tell it's *stubborness* because they could have revised their oversight with their followup game Moon, but they didn't; it controls this exact same way too... with no option for face buttons to control aiming... but it's the moronic save system that really ruins the game; making what would otherwise be a fun creepy experience... instead becomes a repetitive chore with much of the fun sapped out of it. 3DS - new DS to be revealed at E3? Can there be too many games?